Francie Dorman and Britt Cole met, almost serendipitously, after years working in the wedding industry for other companies and elite venues in New England. 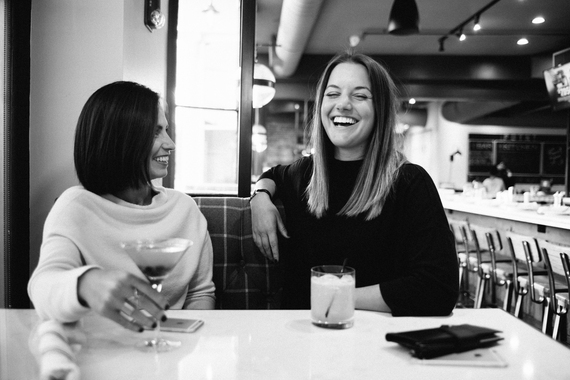 Bonding over having both grown up in the North Shore of Massachusetts and a shared passion for flawless event execution, 42 North Weddings was born. The ladies were confident that their deep industry know-how, unique approach to business and commitment to creating unforgettable experiences was something special. They quickly moved from colleagues to friends and business partners. How has your life experience made you the leader(s) you are today? Britt: I had the urge to start working at a very young age (my first real job was at age 13 at a tea house!). I was always the one in my group of friends that worked the longest hours at my summer job, and took on odd jobs on the side, too. There was just something about working and earning my own money that got me really excited. I quickly realized you can control your own destiny through hard work. I grew up surrounded by small business owners; my dad, husband, and father-in-law are all entrepreneurs. The idea of "you can do anything" has been implanted in my brain, so I always knew I would branch off on my own at some point. It goes back to the idea of creating your own destiny, I wanted to be in control and make my work into something that was a passion, and worked for me. Francie: I have always loved to work. I started babysitting when I was 11 years old (scary to think about now that I'm a mom myself!) When I was in high school, I would go into the little cafe I worked at and open the restaurant at 5:30am before heading off to school for the day - and I was usually back there as soon as school got out. I loved the idea that I could control what was available to me in life, when I was working, and working hard, I was able to make the money I needed to do all the things (read: shopping) I wanted to. Since those first jobs, I have had a lot of jobs. Honestly, I had a hard time finding my perfect place. Some jobs gave me the financial freedom I craved, but I was bored to tears. In others I loved the work, but found myself too sucked in and giving up too many other things that I loved. I honestly never thought I would end up where I am today, but I think having so many different experiences in my working-life has brought me to the sweet spot. Every step, every boss and coworker I have encountered, has taught me either something I knew I wanted to emulate or something I learned I never wanted to carry forward in my career. Every lesson has led me to be the leader I am today. How has your previous employment experience aided your journey starting 42 North Weddings? Britt: My first job in the event industry just sort of happened to me, to be honest. I had spent my first few years out of college travelling (cliche, I know, but I really did! All over! For many years! ), and so when I finally settled back into my home town I wasn't sure of my next steps. I ended up meeting my boss, Tim Hopkins (owner of Timothy Hopkins Catering) at a party, and he was looking for someone to help build his business, and I was looking for a job, so we both kind of took a leap of faith and it worked! I spent five years working with Tim and his team to expand and market his catering business, and it was the best experience I could have asked for to prepare me for my career in the wedding industry. My experience with Tim ranged from sales, menu writing, floor plan development, event logistics, planning and management. Francie: By far, my most inspiring experience was working for a young restaurateur in Boston. She is the very definition of a girlboss. She is the hardest working person I have ever met, and pushes her team to make sure all of their projects are executed perfectly. While working for her, I was also working as a wedding planner for another firm. At the time I never thought my wedding planning career could be as inspiring to me as I felt when I was at the restaurant, even though I was really good at planning weddings and I loved doing it! I think the best thing I did was actually to leave both of those jobs (even though it seemed like a mess at the time!). In order to get clarity on my own project and to figure out my own path. I needed a little distance between me and who I was trying to be so I could sort of reassess and do my own thing in a way that made sense. Most importantly, it was during that mini hiatus that I met and worked alongside Britt who was clearly an inspiration to me and instrumental to getting both of us to where we are now. What have the highlights and challenges been thus far? Britt & Francie: Our biggest highlight happened during one of our weddings this past season - when we shared our first, and most unanimous 'wow' moment together. We had seven weddings together our first season as the 42 North partnership, and they were all beautiful and amazing, but there was one in particular (at a private home in the Berkshires) that was our biggest production. We assembled a killer team, and spent countless hours planning through ups and downs, and the result was absolutely amazing. Right around the moment our Bride + Groom were having their first dance, we both felt so proud - something we won't ever forget! I think one of our biggest challenges has been getting our name out there! It's been a challenge to position ourselves as not necessarily new to the industry, but rather just a new partnership. Britt: I think looking back at my experience and how I started in the industry, my retrospective advice would be to just start somewhere. You probably won't get your dream job right off the bat, but just like in any industry, you need to get your foot in the door. Once you're in, my bigger advice would be to be nice to everyone. Make an effort to create relationships with vendors and industry partners, because those are the people that will be there to help you when you see an opportunity to move up in your career. Plus, you can learn a lot from them! Francie: I would take Britt's advice one step further and say start at the bottom! Seriously! I think wedding planning as an industry, like a lot of women-run industries, has the illusion of seeming glamorous. I'm here to tell you it's hard work, and usually not even a little bit glamorous. I absolutely love it, obviously, but if you go into this industry thinking that you're above hefting racks of glasses up stairs, working a 15 hour day, or answering a client's call on a Sunday morning, this is not the industry for you. So, my advice is to start off as an intern, or work for a business in another wedding-related field (catering company, florist, etc) as a side job or hobby to see the real inner workings of a wedding day. By the time you launch your own brand, or land your dream job, you'll really know what you're doing, you'll already have your place in the industry, and you'll appreciate how far you've come. Britt: Know the value of your work. It's easy for new businesses (and especially women) to undervalue the job they do. Francie and I continue to teach each other this daily as our partnership grows. Francie: In any job, in any industry, you will always have greater success if you consider yourself a part of the team - whatever that might mean for you. For us, we are part of a team of vendors for each wedding. Our success comes from truly being a part of the team, not positioned as the people ordering the rest of the team around. Britt: For us, everything is still so new and exciting! We are building our brand and honing in on our business philosophies every day, and it just seems like we both have endless amounts of energy to put towards this job. However, projects do come in waves, so we have learned how to ride them as they come. If it's a slow day/week, we remind each other to just chill out and take some time to do things for ourselves. When it's a busy week or month, we keep each other's energy up and remind each other there's always a light at the end of the tunnel! Francie: This is something I personally struggle with every day. I have two tiny girls, so I constantly feel like I need to be in more than one place, especially right now when we are in the throes of starting this new business. Honestly though, for me, there are two key things that help me to succeed at maintaining some kind of balance: 1. I chose a career where we work a lot of time when other people aren't working. It's not weird to be emailing with a bride late at night or early in the morning (whenever I can squeeze it in!) because that's when our clients have time to focus on their wedding plans. 2. Most importantly is, I have Britt! We both constantly say we could not be doing this alone, for so many reasons, and that is so, so true. Britt: Our industry is one of the few that is dominated by women, so the landscape of challenges for us, in this industry, is a bit different. The challenge of staying true to who you are, and not trying to be something you are not is an everyday reminder to be as authentic as possible. With what we do, the line can sometimes be blurred between what your life is, and what your brand is. So, there can be a lot of pressure to have a great instagram account, know the right people, hang out at the right spots, and run with a certain crowd. Francie: I think the definition of mentorship has changed a bit now that Millennials are such a large force in the workplace. I think we tend to surround ourselves with little pockets of people who we turn to for different things. It's more like we have a board of advisors helping us through our careers, rather than the traditional mentor who imparts wisdom on a 1-1 basis. For sure, 42 North would not be the business it is right now, or that it will be in the future without mine and Britt's "board", both personal and professional. We try to really push the envelope in everything we do. We try to make every move just a bit different than what we see in the wedding planning market - from our branding to our language to the way we present ourselves, it's all very calculated. And sometimes we need a little push, or push back, from our board of advisors to get to where we need to be with every facet of our company. What do you want to accomplish in the next year for 42 North? Francie: We have really high expectations for ourselves and for 42 North; and we definitely have a "bucket list" of things we want to do over the next year / 5 years / 10 years. I think over this next year, we are working really hard at establishing ourselves as experts in the field. As a new partnership, this all takes time, which is something we are constantly reminding ourselves. Other items on our 1 year plan are things like: get 1000 instagram followers, book a destination wedding and move into an office space.